Meet “Lily” the starving muppet. Here’s something else Barack Obama and democrats can be proud of. With a record number of Americans on food stamps, record unemployment, increased debt and record poverty, Sesame Street will introduce a poor, starving muppet to educate on the growing number of starving children in Obama’s America. Sesame Street has a new muppet who is hungry for more than just cookies. The iconic kids show is set to unveil a new impoverished puppet named Lily, whose family faces an ongoing struggle with hunger issues. 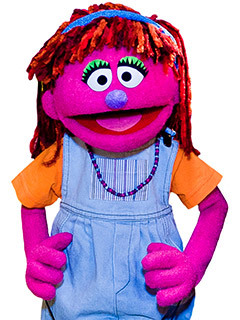 Lily will be revealed in a one-hour Sesame Street primetime special, Growing Hope Against Hunger, which is being sponsored by Walmart. The special will star country singer Brad Paisley and his wife Kimberly Williams Paisley, as well as the Sesame Street Muppets. The special will share the stories of real-life families to raise awareness of hunger issues in the United States, as well as strategies that have helped these families find food.